Are you really ready for this, Millennials? Mitch: Notice how our Millennial colleagues appear interested in just two things: celebs and looking cool? Gen Xers know that the true joy of the New York Wine Experience is not finding something that will impress your Instagram followers, but finding incredibly authentic wines that have a story to tell. Dana: Yeah, that blog was so ... what's the word the kids use these days? ... "extra." Well, while they're busy worrying about the right filters and hashtags, that just leaves more time for us to have actual conservations with the real-life vintners and winemakers who will be there. Mitch: I agree with Emma and Ben that bubbly is a lovely way to kickstart your taste buds, but with all their oohing and ahhing over Champagne and European alternatives, they seem to have missed the renaissance of American sparkling wines. One of my favorites, Roederer Estate, is pouring their opulent l'Ermitage Brut 2011. Stop by, taste some, and ask Frédéric Rouzaud, whose family owns both that property and Champagne Louis Roederer, how they decided that Anderson Valley in Mendocino was the best spot in California for sparkling wine. Dana: With all Ben's talk about Chardonnay, I have to make sure guests don't miss one of Australia's icons, a truly storied white: Leeuwin Estate's Art Series Chardonnay, from the western district of Margaret River. The Horgan family, now in the second generation of ownership, founded it in 1974 after none other than California's Robert Mondavi identified it as a prime vineyard spot when he was scouting the country. The 2011 earned the No. 5 spot in our Top 10 Wines of 2014. Winemaker Tim Lovett is pouring the 2015, which represents the best of Chardonnay—generous flavors on an elegant frame. Plus, ask him about the labels: This one features a collaborative story painting from two contemporary Aboriginal artists. Mitch: Do Millennials think Pinot Noir is passé? I was stunned not a single one made Emma and "Bad Mom" O'Donnell's list. This year's lineup lets you wander through Burgundy, California, Oregon and New Zealand Pinot Paradise. Even if you're a Gen X slacker like me, you don't have to work that hard. At Roar, you can say hi to Adam and Nick Franscioni, whose parents saw Pinot potential in the Santa Lucia Highlands before almost anyone. A little farther down the row, you can try Siduri's Sta. Rita Hills John Sebastiano Vineyard 2015 to see their take on the region. Siduri founder Adam Lee is a fountain of Pinot knowledge and opinions. Ask him about some new projects he's working on. Dana: Being an often-overlooked Gen Xer stuck between the Cali Cab–loving Boomers and the weird trend-drinking Millennials (blue wine?! beerwine?! ), I'm going to advocate for some underdogs. Representing the fine state of Virginia, Barboursville and RdV show what the state can do with red Bordeaux-style blends—bringing together the best of the New and the Olds, kind of like our generation. Barboursville's Italian winemaker, Luca Paschina, has more experience making wine in Virginia than anyone else. Mitch: Italian wine has almost as many compelling stories as it has grape varieties. Lorenza Sebasti and Marco Palanti met when he became winemaker at her family's Chianti Classico estate, Castello di Ama. They fell in love and raised their children on the estate. Now their eldest son has joined the winemaking team. Chat with Marco and try their single-vineyard Chianti Classico San Lorenzo. On the other side of the aisle, Federica Mascheroni is pouring Castello di Volpaia's Chianti Classico Riserva 2015, a gorgeous 96-point wine. She and her family restored a crumbling Tuscan hilltop town and its vineyards, building the winery in multiple abandoned buildings and running pipes under the street to connect them. Piedmont lost an icon this year, Barbaresco's Bruno Giacosa. His daughter and protege Bruna is carrying on his work and she'll be pouring their Barolo Falletto Vigna le Rocche Riserva 2012, a 97-point powerhouse. Speaking of powerhouses, Angelo Gaja has officially handed the reins of his winery to his two daughters and his son, but I'm not sure Angelo actually knows what retirement means. He'll be serving his single-vineyard Sperss 2013. Dana: You're getting a little mainstream there for the Millennials, Mitch: Barolo and Barbaresco get all the attention when it comes to Nebbiolo. But take a look at what's going on over in the Italian Alps in the Lombardy's Valtellina, site of Nino Negri's crazy-steep, centuries-old vineyards that produce a mountain-style Nebbiolo (also called Chiavennasca) that's lighter in body, high in acid and laced with minerality. Winemaker Danilo Drocco can tell you about their "helicopter harvests" as he pours their Amarone-style 5 Stelle Sfursat, made with partially dried grapes. And what about South America, Millennials? Did you forget there's a whole continent making interesting wines down there? Torres, the historic, 140-year-plus-old Spanish wine producer, has been working in Chile since 1979. Ask Miguel Torres Maczassek to tell you about their experiments with Pinot Noir in the cool-climate of Empedrado, where they were the first in the country to plant on terraced slate soils similar to Priorat. And Uruguay should now be on your radar for its Tannat; Alejandro Bulgheroni will be serving his muscular blend, Bodegas Garzón Balasto Uruguay 2015. The oil-and-gas billionaire has built a sustainability-minded winery and hospitality destination, aiming for LEED certification for the entire complex. Mitch: I thought those youngsters would like something sweet, but they seem only to have gotten excited about dessert wines when they found two that were older than them. However, there's an entire row of Ports. Rupert Symington, pouring the Dow's 30 Year Old Tawny, is one of five family members currently running a two-century-old family business. Bordeaux is known for its reds, but its sweet wines are sadly neglected by today's consumers. Visit Aline Baly at the Château Coutet table and let her explain the terroir of the Barsac estate. It's a perfect wine to end a perfect evening. Enjoy! 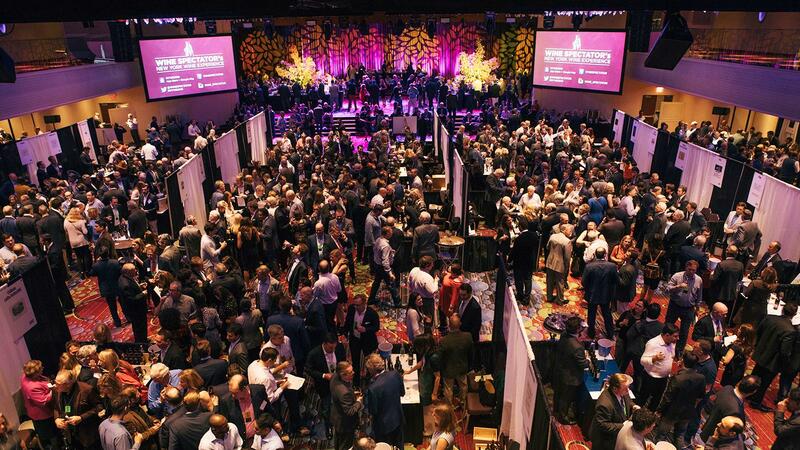 What are you most looking forward to at the New York Wine Experience? Leave a comment here, or tag us on Twitter or Instagram with the hashtag #NYWE2018.